The fold, as a multi-layered metaphor for the relationship between mind and matter, inspires plis/replis. The installation is made up of a highly geometric, folded and suspended structure that amplifies the experiences and metaphors of champagne. The primary structure is a 10 x 10 x 12 m cone suspended in a pyramid in an underground cave (a “crayères”- one of the largest crayères of Vranken-Pommery's 18km long underground system of corridors and caves dating back to Roman times). 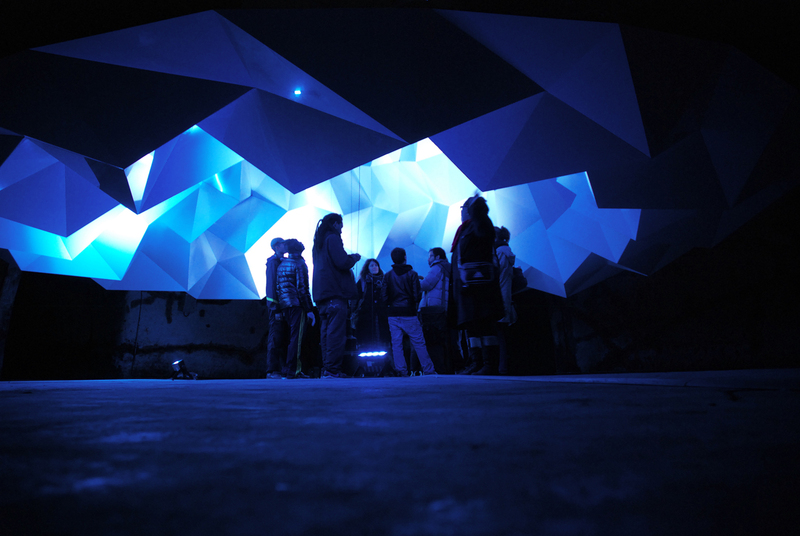 This architectural augmentation of the space also serves as a functional loud-speaker. A glass platform suspended at the focal point within the cone holds a vessel filled with champagne. Using the actual sounds of effervescence picked up by a special microphone immersed in the champagne vessel, a real-time analysis/synthesis audio system creates a continually evolving sound environment, diffused downward from above. 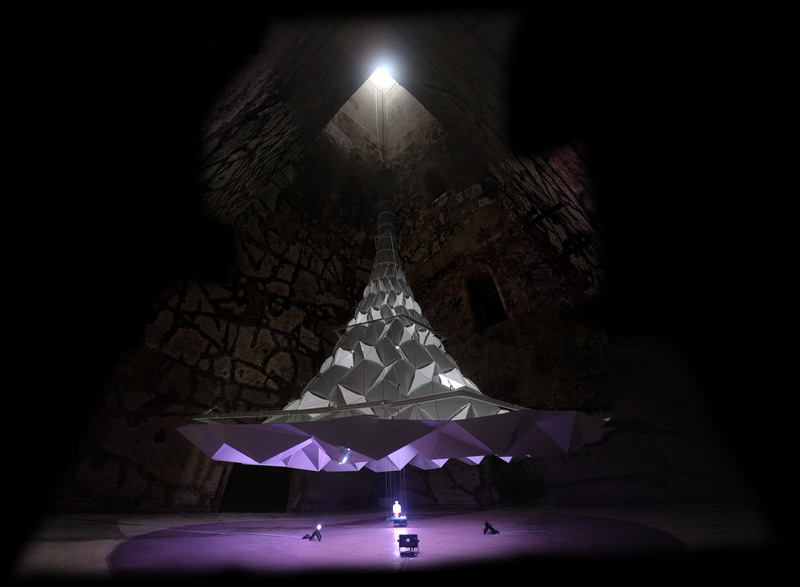 The architectural design of this work combines ancient paper folding techniques with contemporary computer-aided design and manufacturing processes. The form is inspired by mathematician and origami expert Taketoshi Nojima, and especially his work reproducing organic forms from folded paper. Our collaboration with architect Hyoung-Gul Kook allowed us to design, fabricate and assemble the suspended 345 cubic meter structure from 285 flat sheets of aluminum/polyethylene composite, precisely folded 2,535 times. This structure acoustically amplifies the sound from a single speaker-driver in order to create an enclosed space that bathes the listener in sound in its center. More process documentation on a tumblr stream here. Additional documentation by Robin is here.